In 1954, Drucker boldly declared that organizations have only two basic functions, marketing and innovation. While true for any organization, this insight is particularly pertinent for technology-based businesses. The complicated environment surrounding high-tech companies creates a great need for sophisticated marketing, yet these companies continue to have under-developed competencies in marketing and in understanding customer needs. In its first two sections, this essay explores Drucker’s insights with respect to two particularly salient issues for high-tech companies: developing and implementing a market orientation, and sustained break-through innovations. We review Drucker’s insights and synthesize them with the scholarly research on these issues. 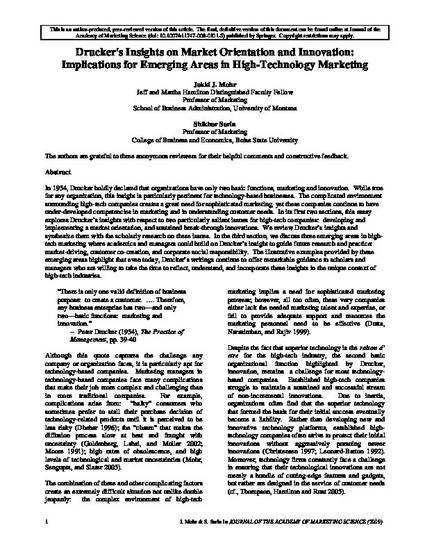 In the third section, we discuss three emerging areas in high-tech marketing where academics and managers could build on Drucker’s insight to guide future research and practice: market-driving, customer co-creation, and corporate social responsibility. The illustrative examples provided by these emerging areas highlight that even today, Drucker’s writings continue to offer remarkable guidance to scholars and managers who are willing to take the time to reflect, understand, and incorporate these insights in the unique context of high-tech industries.